Transform your body without surgery or downtime using Coolsculpting®. Recommended by your trusted physicians at Village Dermatology—it is a clinically proven, safe and effective procedure. No needles, no knives, no anesthesia. With natural-looking results in as little as one treatment session—allow us to help you feel more confident about the areas of yourself you’d love to love more. 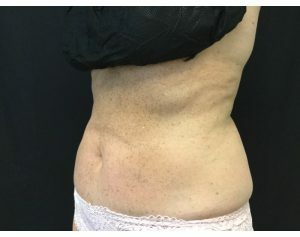 CoolSculpting is a non-invasive treatment that uses controlled cooling to freeze and permanently eliminate fat that resists diet and exercise. Below are some of the most frequently asked questions about this revolutionary procedure! Yes! There are no needles, no anesthesia and no heating or cutting of tissue. Fat cells are more sensitive to cold than their neighboring structures, thereby allowing organs, nerves, blood vessels, muscle and skin to be left unharmed. CoolSculpting is FDA-approved and is the number one non-invasive fat reduction procedure. 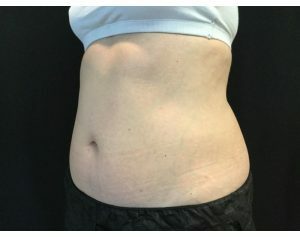 WHY SHOULD I HAVE COOLSCULPTING DONE AT VILLAGE DERMATOLOGY? Since 2007, we have performed over 2,500 cycles at Village Dermatology. We have our own Body Sculpting Specialist, Jane, right in our office! 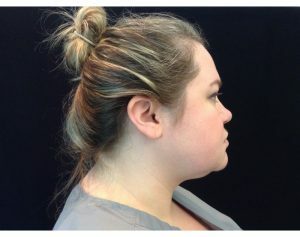 Jane received her certification from CoolSculpting University and is certified to perform all CoolSculpting procedures. We also stay on top of the latest innovations to offer you shorter treatment times and better results. With capable hands, extensive experience and the newest technology, we are committed to giving our patients the very best! Unlike many “fat removal” procedures available today, CoolSculpting results are permanent with a healthy lifestyle. WHAT IF I GAIN WEIGHT IN THE FUTURE? We recommend that you maintain a healthy lifestyle, but weight gain will not cause excess fat in untreated areas. Fat cells in treated areas may enlarge, but no new fat cells will form, minimizing weight gain in the treated areas. You may notice results as early as three to four weeks, but this is usually uncommon. Due to the natural elimination of dead fat cells, patients typically see results in three months. None! Some patients schedule their treatments during their lunch break and return to work right after! Each cycle is 35-45 minutes, depending on treatment area. 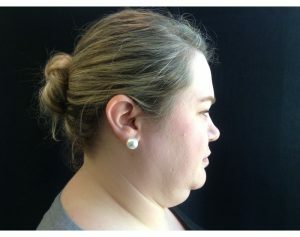 Most areas require two cycles per session (right and left sides). 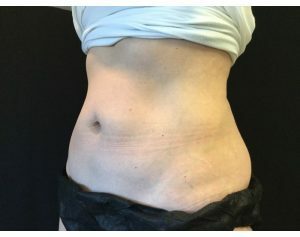 We have two CoolSculpting machines at our office, so some patients opt to treat multiple areas at once. Others prefer to spread out the treatments. You will be given a treatment time estimate at your consultation. You will feel intense cold for the first five to ten minutes. This soon dissipates as the area goes numb. With some applicators, you will feel pulling as suction is applied. Many people read, work on their laptop or take a nap during their treatment. You may feel some tingling or discomfort as the area is massaged after treatment. 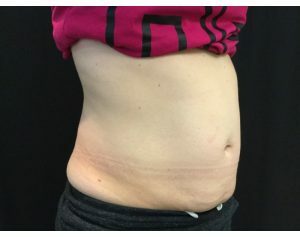 We offer treatments for the upper abdomen, lower abdomen, love handles, inner thigh, outer thigh, upper back (“bra fat”), upper arms, above the knee, underneath the buttocks, and double chin. 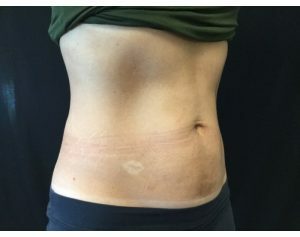 Every patient and treatment plan is unique, but most patients need at least two sessions per treatment area to see full results. You will receive a customized treatment plan and cost at your consultation. 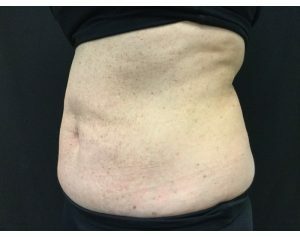 HOW CAN I SAVE ON COOLSCULPTING AT VILLAGE DERMATOLOGY? Purchase four or more cycles and receive 10% off. Purchase eight or more cycles and receive 20% off. I’M IN, HOW DO I GET STARTED?